Let's debunk the story that's using a widely circulated old photo. The viral story of a drunk man being eaten by a python in India — while frighteningly interesting — is fake. This time, the story appears to have gained steam after a "finance professional" tweeted it. But 13,000 retweets mean it's true, right? No. A Google reverse image search reveals that either this particular snake is on a human-eating rampage from South Africa to India, or it's a hoax. Ok the Python eating a drunk pic doing the rounds is a fake. Has appeared for years with different story attached..
Hoax-Slayer debunked the story when it popped up months ago. 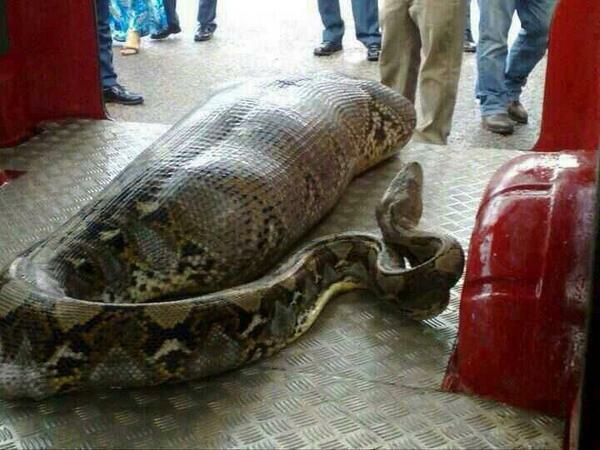 The snake also "swallowed" someone in Indonesia apparently. Serial-killing snake. The very same picture has been circulating in other contexts since at least September, 2012. Linda Laina Nyatoro did post the image on her Facebook page in June 2013, but states in comments that she did not witness the attack as claimed in the message. Earlier versions variously claim that the snake in the picture swallowed a drunken man asleep by a roadway, a man in Jakarta, Indonesia after floods hit the region...None of these variants to the story have been confirmed by any credible news reports. While large snakes such as rock pythons have killed humans, confirmed and documented cases of such snakes actually swallowing adult humans are very rare. The snake also worryingly slithered all the way to China and ate a man. Enterprising Reddit users were also busy pouring water on the story. One said the picture is of "a Reticulated Python, which are not native to India...nor are they capable of eating a person." Others reminded that a python would struggle immensely and likely be unable to open its jaw enough to get past a human's shoulders. Some say the python pictured likely ate a goat or a deer -- but not an entire human. Wow. Python ate drunk man in Kerala. Many facepalm. Much fake and old hoax. So amaze. Wow. Python ate drunk man in Kerala. Many facepalm. Much fake and old hoax.